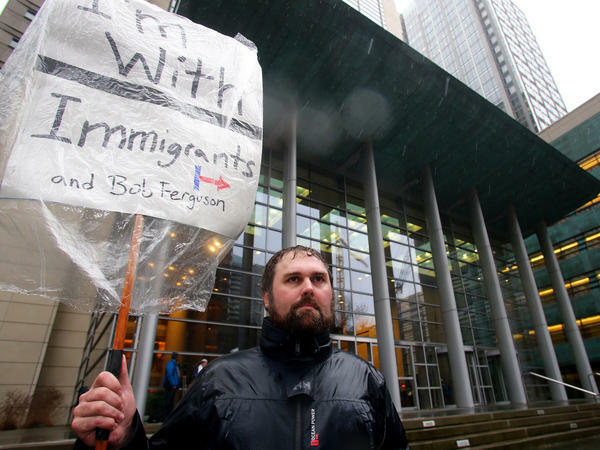 Patrick Wicklund, from Seattle, stands outside the U.S. District Court, Western Washington, on Feb. 3 in Seattle. Washington state Attorney General Bob Ferguson filed a state lawsuit challenging key sections of President Trump's immigration executive order as illegal and unconstitutional. In other words, he decided there was more harm letting the ban continue than there was blocking it until the full case could be heard. But Robart certainly tipped his hand on whether he thought the ban was justified. He questioned Department of Justice lawyer Michelle Bennett, who was representing the Trump administration, asking, "How many arrests have there been of foreign nationals from those seven countries since 9/11?" The Sept. 11 attack was one of the rationales behind the executive order, according to the Trump administration. "I don't know the specific details of attacks or planned attacks," said Bennett, who is from the DOJ's Civil Division. "The answer to that is none, as best I can tell," said the judge. "The rationale was not only 9/11," Bennett said. "It was to protect the United States from the potential for terrorism." Congress gives the president wide latitude in foreign affairs, which includes granting visas. "The court doesn't get to look behind those determinations," she added. But the judge answered: "I'm also asked to look and determine if the executive order is rationally based. And rationally based, to some extent, means I have to find it grounded in fact instead of fiction." Temporary restraining orders generally last up to 14 days. They can be extended, but the idea is to hold a full hearing on an injunction instead. Of course, a higher court can overturn the restraining order in the meantime. Robart has a history of saying what he thinks. He was nominated to the federal bench by President George W. Bush in 2003 and confirmed unanimously in a 99-0 vote by the Senate in June 2004. Before that, he was a lawyer in private practice in Seattle. He has worked with at-risk youth in that city and, before becoming a judge, represented refugees from Southeast Asia. Last year, Robart presided over a case alleging excessive force by Seattle police brought by the Obama administration's Justice Department. During a hearing, he used FBI statistics to note that police use of deadly force in cities in the U.S. involved 41 percent of black people, despite their being only 20 percent of the population living in those cities. Robart took a breath and said, "Black lives matter."